In 2014, Gareth Edwards' Godzilla hit cinemas with successful results, despite it's extremely frontloaded nature and mixed views over the titular monster's limited screentime. Regardless, three years on, we now see the start of a new franchise - one inspired once again by the gargantuan MCU - which will blend a number of cinema's most iconic monsters into a shared universe of their own. Introducing the second monster to this series, and once again one of the most renowned, is Kong: Skull Island. Government agent Bill Randa (John Goodman) spearheads a mission through his Monarch organization to visit the mysterious Skull Island, a remote location completely unexplored by mankind, leading to rumours of just what resides there. Recruited on the mission is former British Air Service captain James Conrad (Tom Hiddleston), journalist Mason Weaver (Brie Larson), and Colonel Preston Packard (Samuel L. Jackson). Things seem intimidating from the get go, and the team soon enough encounter a number of hostilities within moments of setting foot on the island - the most notable is of course the colossal ape himself and self proclaimed king of the island, known only as Kong to it's mysterious natives. The film then of course documents the journey these characters now undertake to escape the dangerous landscape around them, putting them into a huge test for survival whilst also focusing on some side plots that develop the story of Kong in some ways. 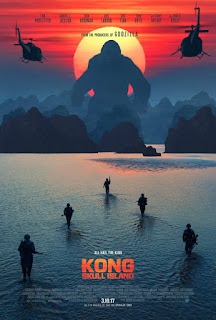 Whilst there's a uber talented cast at hand and an interesting story on paper, the eventual results don't quite meet said potential; Kong: Skull Island feels just as unfocused as it's title, never really developing an interesting basis for the environment these characters explore or the eponymous ape himself - strangely, despite his decent amount of screentime and explosive input in to the film's enjoyable set pieces, it still feels like Kong is taking a backseat to the rest of the film which, sadly, really isn't as entertaining. 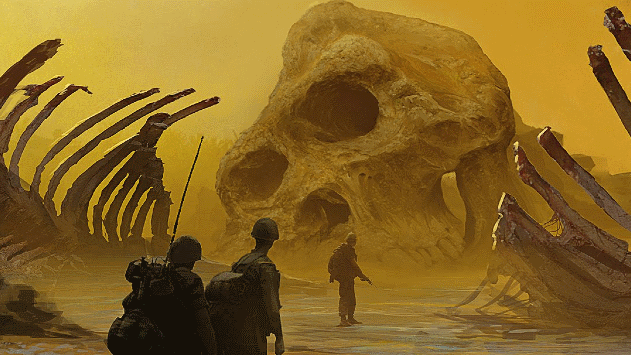 The creatures Skull Island is home to are just as beautifully rendered and animated as Kong, but in terms of their narrative purpose, there is next to nothing to explain about them. They seem to merely be random ugly beasts, popping up when it's time for some gruesome action, who are consistently bombarded with seemingly unlimited bullets among other kinds of military gear (or a few punches from Kong himself) to no avail - making for largely predictable and repetitive action scenes when Kong himself is absent. Even those who find themselves more central to the overall plot and involved in the climactic battle are forgettable and boring, leaving you with little to admire beyond their slick, superbly rendered designs. These action scenes also lead to some devastating events that you'd think would leave most characters scarred and traumatised, but the film even manages to weave in some humour in completely out of place scenarios which makes any dramatic influence these set pieces potentially had gone in an instant. A common criticism of 2005's King Kong, as faithful as it is considered to be to the 1933 original, is that it's 187 minute run time is just too long. Consequently, this leads to a criticism that it takes a painful amount of time for the characters to arrive on Skull Island and meet Kong himself. There's an element of truth to this for sure, but the exact opposite is the key issue to how Skull Island begins - the characters set off on their perilous quest moments after the film briefly introduces them, as if the filmmakers were so keen to get into the main action that they forgot about believable pacing and character development. By the time things concluded I could barely remember any of their names despite their reasonably strong portrayals by a superb cast. These talented actors have roles so poorly drafted that you have no interest in what they're doing half the time, or in the pitiful attempts at dramatic backstory the film sometimes tries to weave in to nail all the Hollywood clichés. You'll find yourself admiring the special effects and gripping battle scenes, but then just begging to go back to said scenes when it's apparent how boring the rest of the film is.